Sue and I are happy to declare this week as BACON WEEK here at joandsue.blogspot.com. As we all know, bacon makes everything better. Sue and I have decided to prove that point to everyone by sharing recipes this week that feature/highlight bacon. Sometimes in a "normal" way and sometimes in a very creative and unconventional way. 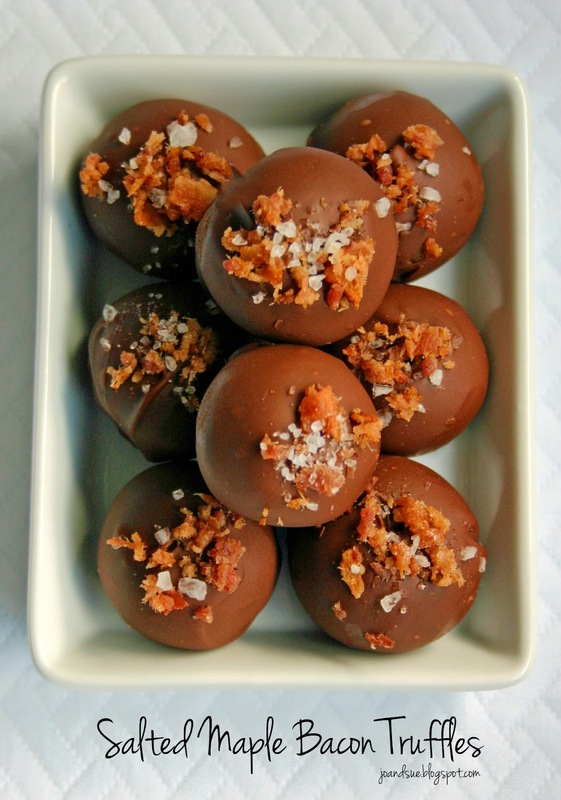 For example....these Salted Maple Bacon Truffles. 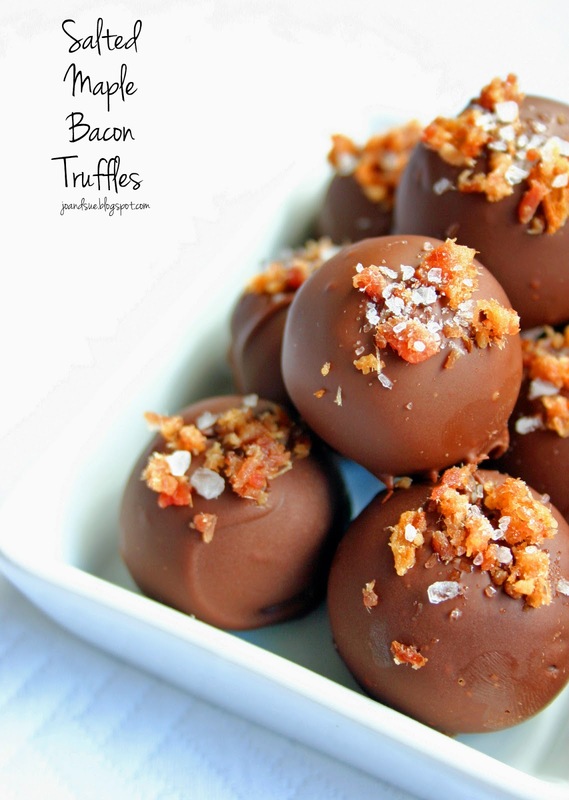 We used our Chocolate Chip Cookie Dough Truffles (click HERE for link)as the base for this recipe and then went all wild and crazy and turned them into something ridiculously bacon-y. Not sure about the whole "sweet & salty" thing? These are a good way to ease into it. I mean, come on, they have bacon. Bacon is the candy of the meat world. In a large mixing bowl, cream the butter and brown sugar until fluffy. 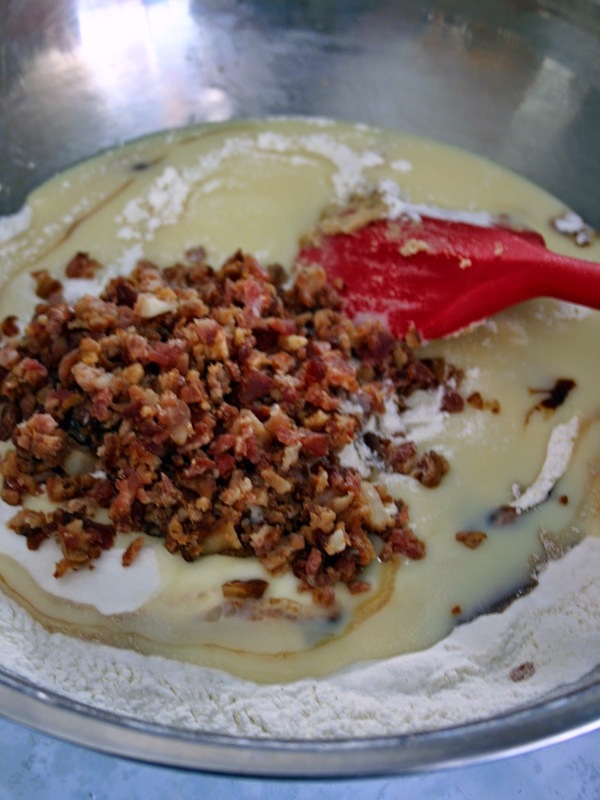 Add in the flour, condensed milk, maple extract, and bacon. Using a small cookie scoop (about 1 Tbsp), scoop dough onto a cookie sheet covered with plastic wrap or parchment paper. I like to roll the dough into balls so they are round but you can leave them with a flat bottom if you want to. 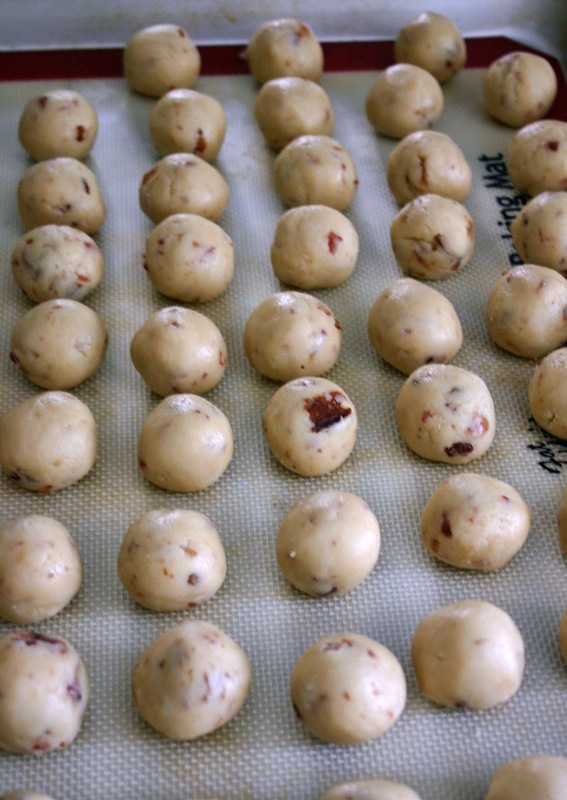 Freeze balls for about 20 - 30 minutes to firm up. When dough is chilled; melt chocolate in a microwave safe dish - or on the stove top in a pan - whichever you prefer. Be careful not to over heat the chocolate or it will seize. Dip a ball into the melted chocolate and then shake off any excess. Quickly sprinkle a pinch of the very finely diced bacon and a smaller pinch of sea salt onto the top of the truffle before the chocolate solidifies. Repeat with the rest of the truffles. I believe I got 56 truffles out of one batch using a small cookie scoop. If you don't have a cookie scoop then you can just pinch off a ping pong ball sized amount of dough and roll it in a ball. Once they are all dipped they do not have to be frozen. You only freeze them for a short time to make them easier to dip. Because of the bacon they should probably be kept in the fridge until ready to serve. You can use whichever chocolate chips you like. I find most people like the milk chocolate better so I tend to use them more often. For the ones pictured above I used 2 cups milk chocolate 1/2 cup dark chocolate, as that is what I had on hand. Remember to keep coming back to check out what other crazy and delicious bacon recipes we are sharing this week! Be sure to pop over to My Turn (for us) and The Chicken Chick and Table For Seven and Moore or Less Cooking for some fun crafty and tasty links! Interested in tons of great bacon recipes and other fun, bacon related things? Follow Jo and Sue blogspot.com's board Bacon? Don't mind if I do on Pinterest. We're sharing over at Carole's Chatter. Be sure to stop by and say Hi. Oh dear me, bacon+truffle goodness. Delicious! Well, I love to come upon a new a different recipe and this sure does fit the bill. 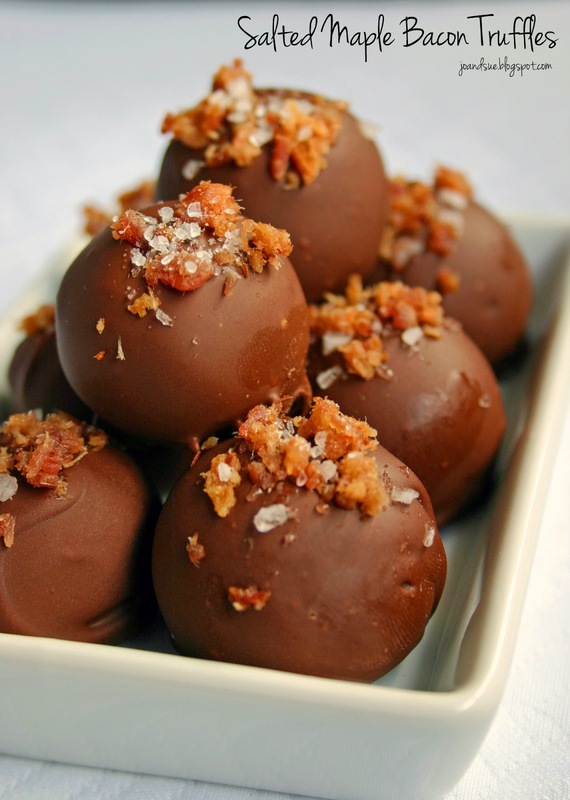 Can't get much better than your Salted Maple Bacon Truffles. Also...should it have a chewy-ness to it or cruchy? It doesn't really matter which cut - just make sure it is very finely chopped. And, either crunchy or a bit chewy is fine. Both work. We tend to go for a bit more on the crunchy side. Do you have any idea if these will freeze well? They freeze very well. When they thaw though the chocolate can sometimes "sweat" a little. It does not affect the taste but it can sometimes make them a little dewy. I just pat them with a paper towel if this happens. :) Hope that is helpful! Does the dough stay raw or did I miss something? I have never cooked them. I imagine it would not work very well. Are you worried about ecoli? Maybe toast the flour to eliminate risk? You could definitely give that a try. Do they have a raw flour taste? They sound delicious, almost like a raw cookie dough. Do you think you can maybe use almond flour? They are like a raw cookie dough. I don't find they have a raw flour taste though. I have never made them with almond flour - if you try it please let us know how they turned out. Thank you very much for the recipe, I made something similar to these a few years back was looking for the recipe again. This sounds right about at what that one was. Thanks for posting this so I can make something else that will disappear at dinner. I froze them for 30 minutes, before dipping them, but I can not get them to stay in a ball shape. Any suggestions? I'm not sure why they won't stay in a ball shape. I've never had that issue as they are quite firm. Do they seem to be runny or something? I'm wondering if you changed anything in the recipe?